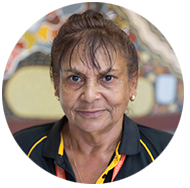 Carol is an experienced engagement coordinator, with highly developed stakeholder management experience having recently held the position of Community Action Plan Coordinator at Kununurra Waringarri Aboriginal Corporation. Prior to joining MG Corporation, Carol worked for the former Western Australian State Premier, Colin Barnett, as a Community Liaison Officer during the early negotiations in relation to the Ord Stage 2 development. Carol also has over 5 years of experience as a liaison officer with the Aboriginal Legal Service, which included in-depth consultation with the MG community in relation to the MG native title determinations. Carol was instrumental in establishing the Gawooleng Yawoodeng Women’s Refuge in Kununurra and has experience working as a Child Protection Officer for the Department of Child Protection. Carol is a local Miriwoong woman who has strong family connections throughout the region. She actively participates in preserving and upholding traditional law and culture and has extensive grass roots community liaison experience, as well as highly developed project management and coordination skills.